G. R. Wood & Co. Essential Varnish - Goosebay Sawmill and Lumber, Inc.
For a decorative finish, (on surfaces that aren’t exposed to spills or abrasion) apply Essential Varnish with alternate coats of G.R. 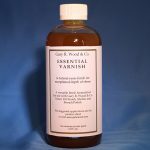 Wood Toner using a wipe-on technique. Build a number of layers to the color and depth desired. The Final coat should be clear Toner. Follow by applying a coat of paste wax such as Fiddes Supreme Wax Polish. For depth priming: Applying 1-2 coats with cloth or brush to bare wood, following the recommended dry time. Sand each coat with 320 grit paper. Top coat with G.R. Wood Shellac. As a finish reviver: Be sure the old finish is clean and free of old wax.. Test a small area to assure proper adhesion and drying. Wipe on 1 thin coat and allow dry two or more hours. Burnish with clean burlap. Follow with a coat of paste wax. As an isolating varnish: Apply 1 coat of Essential Varnish over G.R. Wood Toner before coating with shellac. Lightly sand the Essential Varnish with 320 or higher grit paper as needed. Recommended application cloth is a tight weave cheesecloth. Natural bristle brushes made with goat, squirrel or badger hair are ideal to help lay down very thin coats when brush application is desired. Quality burlap is an excellent burnishing cloth for Essential Varnish. 320 grit paper with a foam backing is useful for sanding between coats. Save your worn paper for final sanding.